We all know that exercise is good for us. But it can be tough to stick with that workout routine when it seems to cause breakouts. Skin benefits from exercise, there’s no doubt. The increased circulation gets more blood and nutrients to the skin, helping encourage repair, and creating a natural healthy flush. It helps reduce stress, which leads to fewer fine lines and wrinkles. And it helps push impurities out our pores. But unfortunately, for some, exercise can also result in those irritating red bumps and pimples. Why does it happen, and what can you do to stop it? Why Does Exercise Lead to Breakouts in Some People? Even if you don’t touch anything else, simply touching your skin with your fingers can transfer bacteria to your skin where it can later cause acne. So how can you reduce your risk that your workout will turn into a breakout? Try these seven tips. You may feel self-conscious about exercising without makeup, especially if you go to a gym, but makeup clogs skin, which can result in blackheads and pimples. Dirty skin, too-even without makeup-can harbor bacteria. Try cleaning skin right before your workout. Just be sure to use a gentle, creamy cleanser, because too much cleaning-particularly with stripping cleansers-can actually be bad for your skin. You can exercise first thing in the morning, wash, and then apply makeup, but if you exercise later in the day, cleanse skin with a gentle cleanser then apply a light moisturizer or hydrating spray (like our Rescue + Relief Spray) before hitting the mat. Wash again afterwards and apply your regular moisturizer. 2. Wipe skin with a clean towel only. 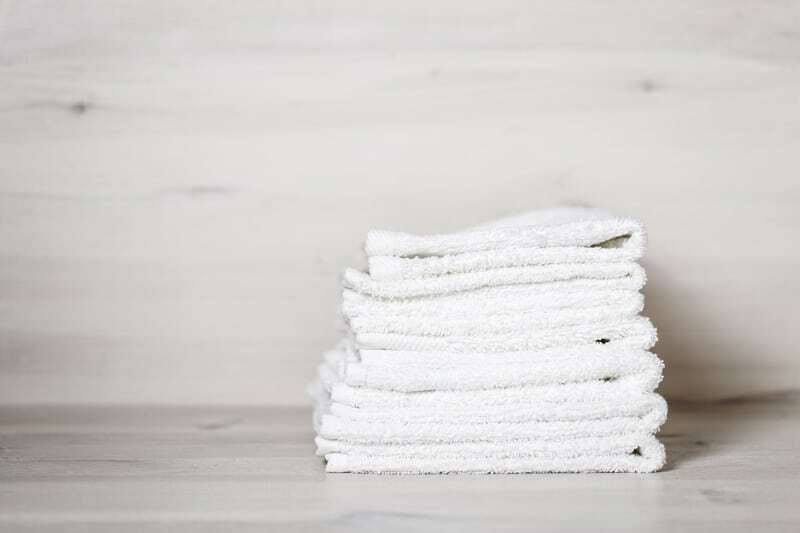 Try to avoid wiping off sweat with your hands, arms, shirt, etc., and use only a clean, fresh towel to blot. Be careful, too, where you put the towel. If you drape it on a dirty exercise machine, for example, and then use it on your skin, you could still transfer bacteria. Better to take your own container-like a bag or pack that you can store it in. Some gyms also offer antibacterial wipes that you can use before stepping onto a machine. You may also want to take along a pack of face wipes for this purpose. Pull them from the package and they’re sanitary and ready to use. Finally, don’t rub too hard-you’ll cause friction that can irritate skin and contribute to post-workout acne. 3. Wear your hair back. Hair can rub against skin while you’re working out, increasing risk of breakouts. Bangs are particularly good at this. If you’re getting forehead pimples after exercising, this could be your issue. Try using a headband and ponytail to keep your hair away from your face. Make sure your band is moisture-wicking, like BondiBands or Halo Headbands. And try to keep your hands off your hair while working out, to avoid transferring bacteria and pore-clogging products from your strands to your skin. All those figure-forming pieces may be flattering, but if you’re breaking out, could be they’re causing too much friction. Sweaty work clothes, helmets, and hats can all rub on your skin and aggravate it. Wear lightweight, loose-fitting clothing made of natural fabrics that allow your skin to breathe and won’t rub and chafe. Polyester and other man-made fabrics can trap moisture against skin. Moisture-wicking fabrics are best. 5. Make sure you’re exfoliating regularly. Sometimes, your acne has nothing to do with your clothes and everything to do with dead skin cells on the surface of skin. These form a hard layer on top of skin, trapping in dirt and oils. Make sure you’re exfoliating at least 1-2 times a week, and consider dry brushing to help reduce body acne. Whether you’re in a hot gym or exercising outdoors under the hot sun, heat and humidity can stress your skin, increase surface oils, and block pores. Try to exercise in cool areas, or during cooler times in the day, like first thing in the morning or at dusk. Basements are great for home exercise as they’re typically cooler than the rest of the house. Otherwise, open a window or turn on the cooler in your exercise room, or seek out a gym that keeps the temperature a bit on the cool side. It not only washes away bacteria and sweat, helping cleanse your skin, but it can cool you down so the sweating stops by the time you step out. You can increase your odds of remaining acne-free by showering with a loofah glove or other exfoliating tool to help wash away old, dead skin cells that can clog pores. Don’t forget to apply moisturizer afterward. (Our Calming Moisture and Body Repair Lotion help extend that healthy glow!) Skin that is too dry will rebel by producing more oil. And always protect with sunscreen before heading back out into your life. How do you prevent acne when working out? Please share any ideas you may have. Photo courtesy nenetus via freedigitalphotos.net.